The Discernment Committee kept up the pace in September and accomplished tremendous progress. We sent teams of three committee members out to visit each of the candidates in their home parish setting. 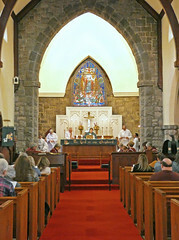 The teams discretely observed a Sunday worship service. They also shared a relaxed meal in conversation with the candidates and their families. The teams returned and reported in detail about their experiences to the entire committee. We then gathered and together made the last big steps in our discernment. At the end of September, the Discernment Committee met with the Vestry to deliver the Presentation of Candidates. These are the candidates that the Discernment Committee, all sixteen of us to a person, would be confident to call as our next rector. For this presentation we pulled together and presented to the Vestry all of our materials about these final candidates: this included the paperwork that we received from Canon Alvarez at the start, transcripts from our interviews, reports from the tour and dinner teams, reports from the traveling teams, references, and our observations and feelings that support our recommendations. This is a major transition in our journey to welcome a new rector to Good Shepherd. During October, the Vestry will meet and interview these final candidates and get to know them and their families. 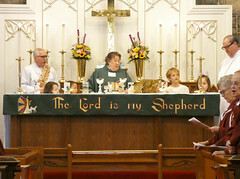 The Vestry, guided by the Holy Spirit, will complete the discernment process and call the next Rector of Good Shepherd. The Discernment Committee will remain engaged in a consulting role to support the Vestry in whatever way they need. We are deeply grateful for the prayers and the respect for confidentiality that our entire congregation has provided through this process. It has been wonderful for us. 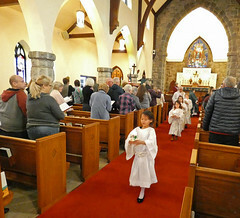 We now wish to modify these two very important requests to include the Vestry: first that you hold the Vestry and these candidates and their families in your prayers, and second that you all continue to be vigilant in supporting both the Vestry and the Discernment Committee with regard to confidentiality. This has been, and will continue to be, very important for the health of our beautiful parish. We, the Discernment Committee, are honored with the trust you all have given us. We feel the Holy Spirit with us … and we are very excited about the next Rector of Good Shepherd!